When building a retaining wall with stone or concrete landscaping blocks, you can reinforce the wall by using any brand of concrete landscaping block adhesive. It also is commonly used to glue capstone products to the last layer of wall stone or block as well. A specific landscaping adhesive should be used to complete this project because the adhesive should be formulated specifically for constant outdoor exposure. Because of constantly changing weather and atmospheric conditions, the adhesive needs to be of landscaping quality in order to perform well. Load a caulk gun with a block adhesive cartridge, cut the tip off with a utility knife, and pop the inner foil seal. Large projects require a lot of adhesive to complete. Large adhesive cartridges are available and require the use of a large caulk gun. When installing block or stone with adhesive, you do not need to cut the tip of the caulk cartridge off at an angle like you do with other types of caulking projects. The inner foil seal can be popped with any long object. Nails are the most common instrument used to pop the seal. Dispense a line of adhesive 1 inch from the front edge of the stone and 3 inches from the rear of the stone. This will provide a more stable installation. Stone and block walls used as landscape features usually hold back dirt. Two lines of adhesive will keep the the soil from pushing the block wall forward over the years--especially if it is a high wall. Lay the next layer of stone into the double adhesive line. Continue adding layer upon layer of wall stone until the final layer is complete. 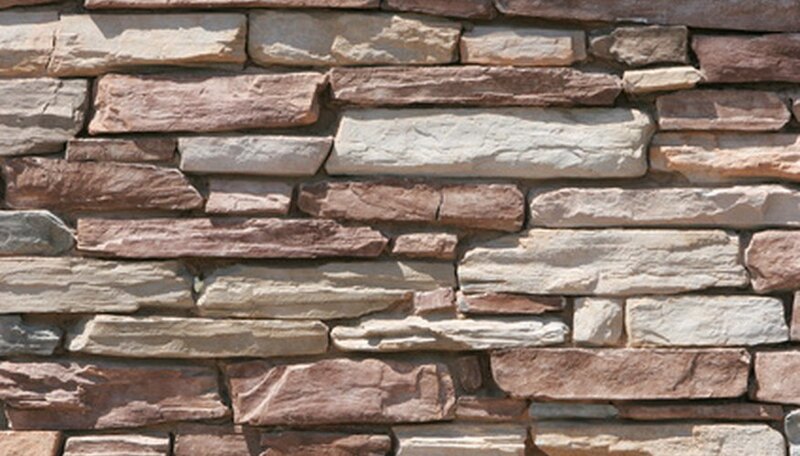 Some stone walls can be capped with flat stones to finish the stone wall off and make it more visually appealing. Home-improvement centers usually stock capstones that match the block so you will be able to cover the last layer of landscaping block. The capstones will make either wall style look finished and as if they were completed by a professional. Allow the adhesive to cure for 24 hours before back-filling soil behind the wall. Cutting stone is most easily done with a diamond-bladed paver saw. A paver saw and a tile saw are similar in design. Only the blade and other, non-functional design features are different. If you want to save a little money instead of renting a paver saw, consider cutting your stones and wall blocks by scoring them well with a masonry chisel and a hammer. Then, place the chisel blade directly over the scored line, and give the chisel a hard whack to complete the cut.